Stroll the streets of America and it’s quickly obvious that few have cared about placing homes and other buildings in regard to the sun’s position during the year. The feeling has been just turn a switch and an air conditioner or a heater will make the space comfortable. Homes and buildings consume almost 40 percent of all the energy produced in America. They use more than 70 percent of the electricity generated in the nation, contributing about half of the United States’ carbon emissions. Heating and cooling homes and buildings accounts for half of the energy they use. Simply siting them with the sun’s path in mind can go a long way in reducing energy use and costs for heating and cooling. And unlike some of the solar technologies looked at by Miller-McCune.com lately, this one is essentially free. The worst possible placement of any living or working structure is where the main portion faces east to west. In such cases, the structure maximizes solar heat gain in summer and gets almost no heat from the sun in winter. The ideal orientation (which reverses in the Southern Hemisphere) would have a house or a building facing south, with its east and west sides reduced as much as possible, and the northern portion well protected from the elements. The difference between the best and the worst orientation in heating and cooling loads is remarkable. An east-west building would naturally be four times hotter in the summer than its south-facing counterpart due to greater exposure to sunlight, while the latter would be four times hotter just from the incoming solar energy in winter. All the heat accumulated in summer by the poorly oriented structure likely would see those inside flip on the air conditioning, while the lack of warmth from the sun in winter will see them turn up the heat. Both moves demand a lot of energy, with the heating in particular using fossil fuels. A convergence of cheap and abundant fuels, the development and availability of heating, ventilating and air-conditioning equipment, and utilities hoping to sell as much oil, gas or electricity as possible has numbed people to considering building or buying structures with the sun in mind. After World War II, “The Gold Medallion Program,” and the slogan “Live Better Electrically,” conceived by General Electric and adopted by local electric utilities, urged Americans to buy electric air conditioners and heaters — and consume more electricity. The ad campaigns by American utilities succeeded. Electrical generation rose by more than 500 percent between 1945 and 1968 and continues to escalate. Natural gas production almost tripled during the same time frame. Perhaps, had Americans read Socrates instead of listening to ad men, we would not be facing the crisis Schlessinger speaks of today. 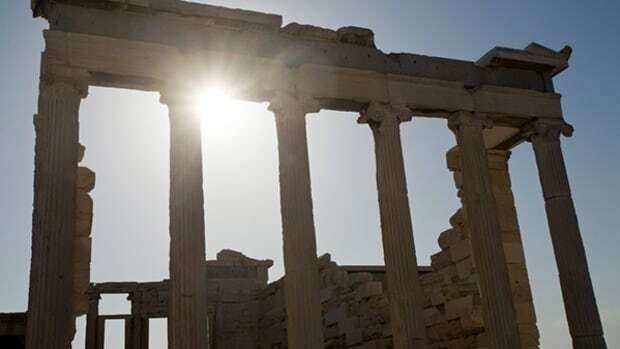 The great philosopher lived in a time when haphazard building was the norm and Athenian society had to deal with “peak wood” — the primary fuel of that day. Socrates offered a way out. He suggested building a pleasant-as-possible house to live in, which he described as naturally “cool in summer and warm in winter.” To accomplish such a feat, he suggested facing the main portion to the south. With such an orientation, Socrates argued, during winter “sunlight will penetrate the shaded porch and shine into the main rooms abutting it, warming them up.” Conversely, in summer, “As the sun travels above our heads,” Socrates explained, “the roof will keep the house well shaded. Joe Kosmer agrees wholeheartedly, though almost 2,500 years separate him and the auditor. Kosmer lives in a solar home built to Socrates specifications. He states emphatically that if you don’t incorporate Socrates’ strategy into your building plans, “You simply become a 21st-century Nero: fiddling with home design as America” burns up its fuel. In Socrates’ time, however, window coverings made from transparent glass did not exist. Today we have specialized window glass that enhances a solar home’s performance by letting the shorter wavelengths belonging to sunlight through. When transformed into heat as the rays hit the interior, they take on longer wavelengths that have great difficulty escaping back into the outdoors. This is the greenhouse effect, although in this instance it’s a positive. The house therefore gets considerably warmer than it would have in Socrates’ day. Special coatings on the glass can impede the interior heat from radiating to the outside, making the house an even more efficient heat trap. A slab of concrete doubling as the floor absorbs the incoming solar heat. At night, as the house cools, it releases the stored heat. Encasing the entire exterior with rigid polyurethane insulation improves heat retention in winter as well. It also keeps the house cool in summer by acting as a barrier between the hot weather outside and the cool interior. Four-foot eaves along the roof also help keep the house pleasant year-round. As Socrates explained and Kosmer confirms, they control solar heat gain seasonally, allowing the sun’s energy to come in through the windows in winter but blocking more and more sunlight as the sun gets higher in the sky after winter. At the summer solstice, no direct light enters. If a solar home works this well in the tough winter in upstate New York, it will work well anywhere in the United States. Even better news is that it cost the same to build as a traditional new home. Like the advice given to Dustin Hoffman in The Graduate, some people think the future of solar cells lies in plastics. Here's why.